Alifu, H., Hirabayashi, Y., Johnson, B.A., Vuillaume, J.-F., Kondoh, A. and Urai, M. 2018. Inventory of glaciers in the Shaksgam Valley of the Chinese Karakoram Mountains, 1970-2014. Remote Sensing 10: 1166; doi:10.3390/rs10081166. The Shaksgam Valley is positioned on the northern slope of the Karakoram mountain region of western China. A number of glaciers exist there, yet an accurate historical and up-to-date analysis of glacial area change in this region has remained elusive -- until now. Working with remote-sensing imagery from a variety of sources, Alifu et al. (2018) were able to compile a glacial inventory for the Shaksgam Valley for the years 1970, 1980, 1990, 2000 and 2014 from which they were able to assess the temporal change in total glacial area over the past four and a half decades. Their results are summarized in the figure below. As shown in Figure 1, across the entire period (1970-2014), the total glacier area remained unchanged, although there were individual differences (increases or decreases) in some (mostly smaller) glaciers. Trends in glacier terminus position, in contrast, revealed an advance in 32% of all glaciers, a retreat in 46% and a relatively stable terminus position across the period of study in 22% of the glaciers. However, the authors note that "compared to the advancing glaciers, retreating glaciers tended to be smaller glaciers," which helps to explain why the total glacier area remained unchanged across the four-plus decades. The results of this study run counter to those of other observations from around the world that show glacial retreat in response to rising global temperatures of the past century and are somewhat of an enigma to the climate-alarmist narrative of dangerous CO2-induced global warming. Nevertheless, this glacial stability is an observational fact that weakens their narrative; and so they have some explaining to do. Figure 1. 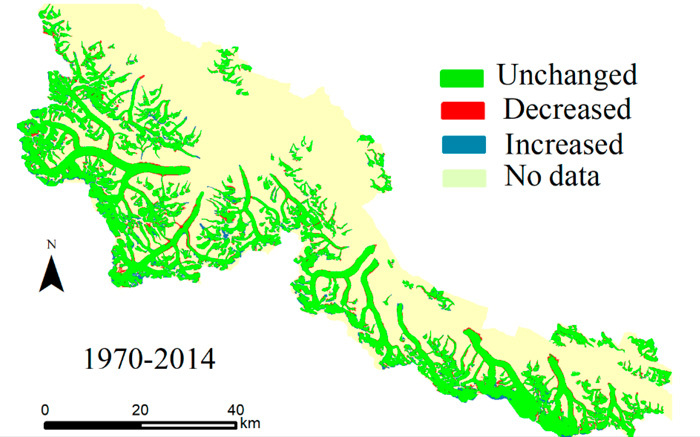 Spatial patterns of glacier area change in the Shaksgam Valley over the period 1970-2014. Source: Alifu et al. (2018).